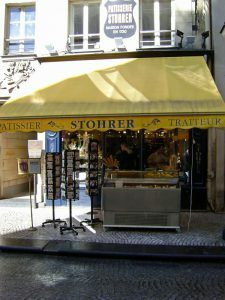 Nestled among the many wonderful fish, butcher, cheese, produce and other fine-food shops on the market street Rue Montorgueil in Paris’s 2nd Arrondissement is one of my favorite pastry shop – Stohrer, the oldest patisserie in all of Paris. Technically called a patissier-traiteur because the shop offers a range of delicious meal and snack items in addition to desserts – including such delicacies as foie gras with fig chutney, smoked salmon with grapefruit, and seafood vol-au-vent – Stohrer is nevertheless best known for its fantastic pastries and its unbelievable history that stretches back to before the French Revolution. 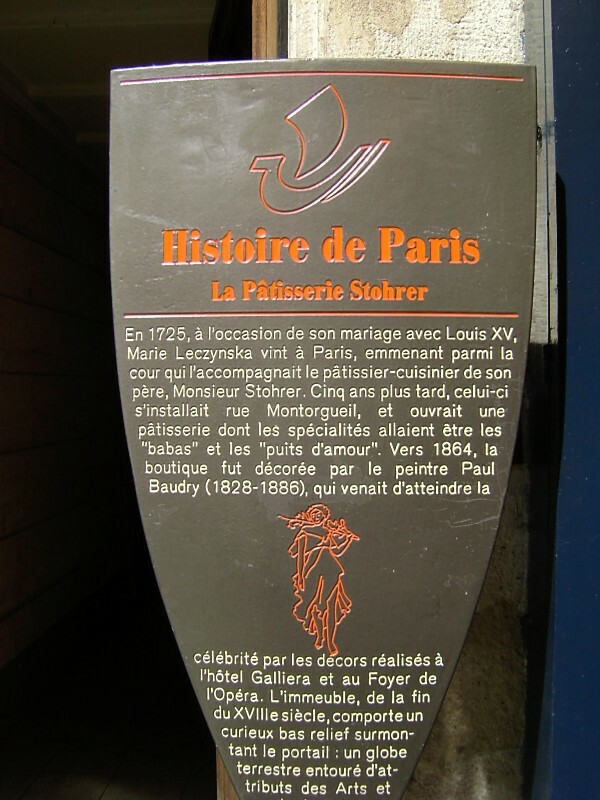 Nicolas Stohrer, the founder of this fantastic sweets shop, served as the official pastry chef for king Louis XV and his entire court at Versailles in the early 1700s before striking out to establish his own pastry business in Paris. In 1730, he opened his shop on the Rue Montogueil, where it still exists today. But even before dazzling French royalty with his decadent desserts, Stohrer served as an apprentice chef for King Stanislas of Poland. In Stanislas’s royal kitchens, he created a wine-soaked brioche flavored with saffron, pastry cream, nuts, graps and dry currants. The King, who was fascinated with both the dessert and the stories of “One Thousand and One Nights,” named the dish the Ali-Baba. Upon relocating to the French royal palace, Stohrer swapped wine for rum, and the new rum-flavored dish became known as the Baba au Rhum, which is Stohrer’s most famous pastry and one of the shop’s best sellers for nearly 300 years. I’ve been to Stohrer dozens of times during my many visits to the City of Light. And while I always try at least one new confection (like the pistachio-flavored L’Antares cake, the rose-and-raspberry-flavored Le Rosier tart, and the chocolate, cinnamon, raspberry and fig Le Barbade tart) during each visit, I also never fail to stock up on Petits Puits d’Amour, small, bite-sized versions of the shop’s signature pastry. If I had to choose only one food to eat for the rest of my life, it more likely than not would be this fantastic Stohrer treat. 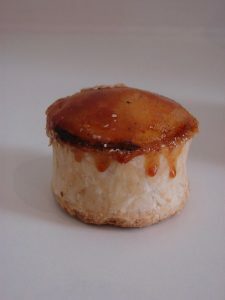 This entry was posted in Patisseries, Royalty, Rue Montogueil and tagged Baba au Rhum, patisseries, Puits d'Amour, Rue Montogueil, Stohrer by Bob Adams. Bookmark the permalink.